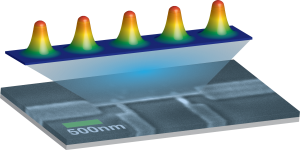 This illustration depicts a short row of vortices held in place between the edges of a nanowire developed by Johns Hopkins scientists. Graphic by Nina Markovic and Tyler Morgan-Wall. 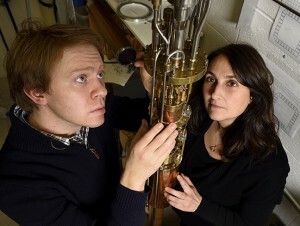 “We have found a way to control individual vortices to improve the performance of superconducting wires,” said Nina Markovic, an associate professor in the Department of Physics and Astronomy in the university’s Krieger School of Arts and Sciences. Graduate student Tyler Morgan-Wall and his faculty adviser Nina Markovic inspect a dilution refrigerator used to cool materials to nearly absolute zero. Photo by Will Kirk/Homewood Photography. Markovic, who supervised the development of these wires, said other researchers have tried to keep vortices from disrupting a supercurrent by “pinning” the twisters to impurities in the conducting material, which renders them unable to move. 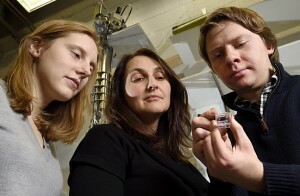 From left, Johns Hopkins undergraduate Hannah Hughes, her physics professor Nina Markovic and grad student Tyler Morgan-Wall examine a chip that holds a silicon substrate with an aluminum nanowire on top. Photo by Will Kirk/Homewood Photography. The lead author of the Physical Review Letters article was Tyler Morgan-Wall, a doctoral student in Markovic’s lab. Along with Markovic, the co-authors were Benjamin Leith, who was an undergraduate at Johns Hopkins when the research took place; Nikolaus Hartman, a graduate student; and Atikur Rahman, who was a postdoctoral fellow in Markovic’s lab. This research was support by National Science Foundation grants DMR-1106167 and PHYS-1066293. The Physical Review Letters journal article may be viewed at: http://journals.aps.org/prl/pdf/10.1103/PhysRevLett.114.077002. Color illustration and photographs available; contact Phil Sneiderman.